The Victorian inspired Carlton high level bathroom suite, an excellent solution for providing your home with a stunning luxury period look. 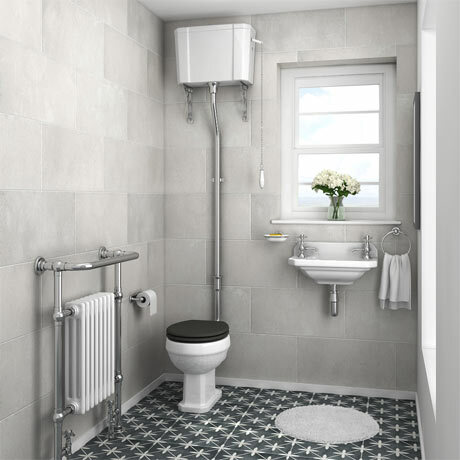 Toilet comes supplied with a polished chrome traditional high level flush pipe pack which includes a high level flush pipe, fulcrum lever, chain pull and ornate cistern support brackets. The traditional 2 tap hole wall hung cloakroom basin with overflow is the ideal size for fitting into a small bathroom or cloakroom where space is hard to find, made from high-grade vitreous china ensuring a quality finish and long lasting durability. Bring a touch of style and elegance into your home with this classic cloakroom suite. Comes with a 5 year guarantee against faulty workmanship or materials. Some small dimensional variation may occur due to manufacturing tolerances. Toilet seat shown in photograph not included (sold separately). Q. hi, what would be the cost of the complete set (seat, waste, etc) and do you sell all the bits that are needed at your store? Hi, the cistern is ceramic yes. We sell many different seats, traps and wastes so it is difficult to give you an exact price as it would depend on you choices. Seats start from £12.95, traps from £6.95 and wastes from £9.60. I hope this helps, please let me know if you require any further info. Hi Kaz, most toilet seats would be able to fit this pan. Here's one we can recommend - Beech-Wood-Toilet-Seat-82983. Hope this helps! Q. Is the chrome pipe adjustable to different heights? Hi, yes the pipe can be cut to suit the project, it should be cut from the bottom of the pipe that attaches to the cistern, the joint where top pipe meets bottom pipe. Thanks, please let me know if you have any further questions. Q. Can you choose right or left hand flush on this product? Hi Mike, unfortunately not, the flush is on the right hand side as you look at the toilet. If you would like to discuss alternatives please call today and we will be happy to look into this for you! Thanks.